Found throughout the state almost everywhere except in very wet places and in dense woodland. It often forms a good part of permanent pastures but is inferior to Kentucky bluegrass. It is sometimes confused with the last species [Poa autumnalis] from which it is easily separated by its flat stem. Roll the stem between the fingers to ascertain if flat or round. Common Name: Canada blue grass Duration: Perennial Nativity: Non-Native Lifeform: Graminoid General: Rhizomatous perennial grasses, to 1 m tall or more, shoots often solitary and connected by rhizomes underground, but sometimes loosely tufted; stems, nodes and sheaths flattened or strongly compressed in cross section; stems wiry, with the nodes obviously exposed, sometimes decumbent at the base. Vegetative: Blades 1.5-4 mm wide, grooved above on both sides of midvein, flat to folded, generally smooth or scabrous on veins, generally prow-tipped; sheaths open three-quarters of the length to near the base, glabrous to scabrous and compressed-keeled; ligules thi Inflorescence: Panicles 2-10 cm, generally 1/6-1/3 as wide as long, erect, somewhat contracted, mostly with 1-3 branches per node; branches 0.5-3 cm, erect to ascending, or infrequently spreading, with 1-15 spikelets; spikelets 3-7 mm, laterally compressed, with 3-7 florets; glumes distinctly keeled; lower glumes 3-veined; calluses usually webbed, sometimes glabrous; lemmas 3 mm, lanceolate, distinctly keeled, keels and marginal veins short-villous; disarticulation above the glumes, below the florets. Ecology: Found on moist, often disturbed low ground, from 6,000-8,500 ft (1829-2591 m); flowering April-October. Distribution: Widespread throughout the US. 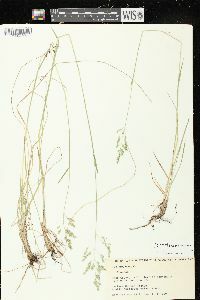 Notes: This species is distinguished by the presence of rhizomes connecting solitary or loose clusters of stems with prostrate bases that curve upward to erect; the strongly compressed stems (flattened rather than round in cross section); and the narrow panicles. 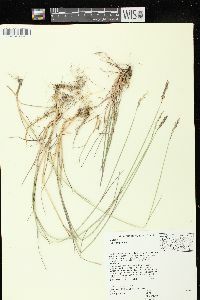 A review of herbarium specimens suggests that the panicle branches are often ascending at a 45 degree angle rather than being appressed to the rachis, creating a panicle that is somewhat narrow but not totally compressed. Poa fendleriana and P. longiligula also have dense, narrow panicles, but both those species have terete or only slightly compressed stems, both grow as bunchgrasses rather than being strongly rhizomatous, and P. longiligula has long ligules up to 18 mm long. Ethnobotany: Unknown, but other species in the genus have uses. Synonyms: Paneion compressum Editor: LCrumbacher2012, AHazelton 2015 Etymology: Poa comes from the classical Greek name poa, poie, or poia for "grass" or "pasture grass", and compressa means compressed, flattened. Culms erect, 2-7 dm from long running rhizomes, not tufted, strongly flattened, 2-edged; lvs 2-4 mm wide, the cauline ones seldom over 1 dm; ligule short, mostly 1-2 mm; infl usually compact and narrow, bluish- or grayish-green, 2-8 cm, its branches usually paired, bearing spikelets to near the base; pedicels of the lateral spikelets 0.5 mm; spikelets 4-6 mm, 3-6-fld; first glume 1.7-2.4 mm, the second 1.8-2.8 mm; lemmas firm, 2-2.8 mm, with or without a small basal web, slightly pubescent on the keel and marginal veins below, the intermediate veins obscure; anthers 0.9-1.7 mm; 2n=14-56. Native of Europe, established in open, usually dry, variously acid or (along highways) alkaline soil throughout our range, to Alas., Ga., and the Pacific.